The event is free, open to the public and begins at 7:30 p.m. in Louis J. Roussel Performance Hall, located in the Communications/Music Complex on the corner of St. Charles Avenue and Calhoun Street. A complimentary wine and cheese reception will immediately follow the performance in the Collins C. Diboll Art Gallery, located on the fourth floor of the J. Edgar and Louise S. Monroe Library. Part of the ongoing centennial celebration at Loyola, this performance marks the official debut of the College of Music and Fine Arts’ new Steinway grand piano, made possible through the leadership gift of a generous Loyola donor and supplemented by the Steinway Society of New Orleans, Rita Huntsinger and the college’s visiting committee. 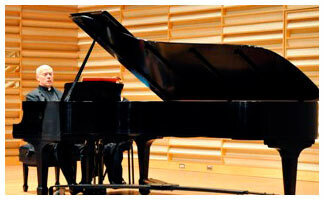 Duggan is a two-time winner of the Johann Sebastian Bach International Competition for Pianists in Washington, D.C. He has performed with orchestras around the world, including the Louisiana Philharmonic Orchestra, the Buffalo Philharmonic, the Leipzig Gewandhaus Orchestra, The Prague Chamber Orchestra and The American Chamber Orchestra, among others. Duggan has served as a professor, adjudicator and guest artist at many prestigious institutions, including the Eastman School of Music and the Golandsky Institute at Princeton, N.J. He is currently an associate professor of piano at SUNY Fredonia. In 1999, Duggan released the CD, "Seán Duggan Plays Bach: A Monk and His Music." For the 250th anniversary of Bach’s death in 2000, Duggan performed the complete cycle of Bach’s keyboard works eight times in various American and European cities. He is currently in the midst of recording those complete works, which will comprise 24 CDs. A native of New Jersey, Duggan began playing piano at age 10. He received his Bachelor of Music in piano performance from Loyola and went on to complete his Master of Fine Arts at Carnegie Mellon University in Pittsburgh. Duggan spent three years as the Pittsburgh Opera Company’s pianist and assistant chorus master. He also taught piano at Carnegie Mellon and was a member of the Carnegie Mellon Piano Trio. In 1982, Duggan left Pittsburgh to enter the Benedictine order at St. Joseph Abbey near Covington, La. Six years later, after finishing his thesis "A Crystallization of Bach," he completed his Master of Arts in Theology at the Notre Dame Seminary in New Orleans and was ordained to the priesthood that same year. From 1988 to 2001, Duggan taught music, Latin and religion at St. Joseph Seminary College and was the director of music and organist at the abbey.